The typhoon is projected to track near southern Japan on Saturday morning local time with sustained winds of 120 kph (75 mph) — the equivalent of a Category 1 hurricane. This storm comes on the heels of Typhoon Trami, which made landfall this past Sunday in Wakayama province. The country has seen more than its fair share of named storms this year: Eight came close enough to bring direct impacts on the country. Kong-rey will be the third former super typhoon to impact Japan this year, though — like the previous two, Jebi and Trami — the storm will have weakened below the super typhoon threshold (winds greater than 240 kph) when it reaches the island nation. In the first days of September, Jebi — the strongest typhoon to hit the mainland in 25 years packing wind gusts of over 200 kph (125 mph) — slammed into Kochi province. When Typhoon Kong-rey nears mainland Japan, it is currently not forecast to be as strong as Jebi or even Typhoon Trami, which made landfall as a strong typhoon 157 kph (97 mph). 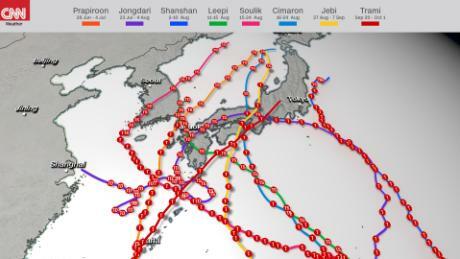 However, it is forecast to follow a similar track that Typhoon Prapiroon took in early July, skirting between the Korean Peninsula and western Japan. Typhoon Prapiroon and a stationary “Baiu” front caused one of the deadliest disasters Japan has experienced since the earthquake and tsunami of 2011. Hundreds died from flooding as Prapiroon drew moisture across the mountainous terrain of central Japan. In the course of 10 days, some locations in Japan received two to four times the amount of rain they normally receive in the month of July. This storm is not forecast to dump nearly as much rain, but portions of southern Japan and South Korea could see upwards of 250 mm (6 inches) of rain as Kong-rey passes by — which could lead to flash flooding and the potential for landslides.